A new company has secured a lease at Helsby Station at the former old waiting rooms at the Chester end of Platform 1. "Indulgence Furniture" makes beautiful rustic handmade furniture and has many one off pieces of designer furniture and art work to adorn any home. There are also plans in place for a tearoom, where you will be able to quench your thirst and have a light snack before boarding or alighting your train. North Cheshire Rail Users Group wish them every success for the future. They are open weekdays and Saturdays right though the year. It really is well worth a visit. The Shop can be contacted for any queries on 01928 723631. Helsby station is currently having issues with its Platform lighting, so do take care if boarding or alighting services here. The areas affected are the Chester end of Platform 1, 2 and 3. Customer Information Screens (CIS) are also out of action on Platform 2, both issues have been reported to Arriva Trains and the problems should be rectified soon. On a sadder note. 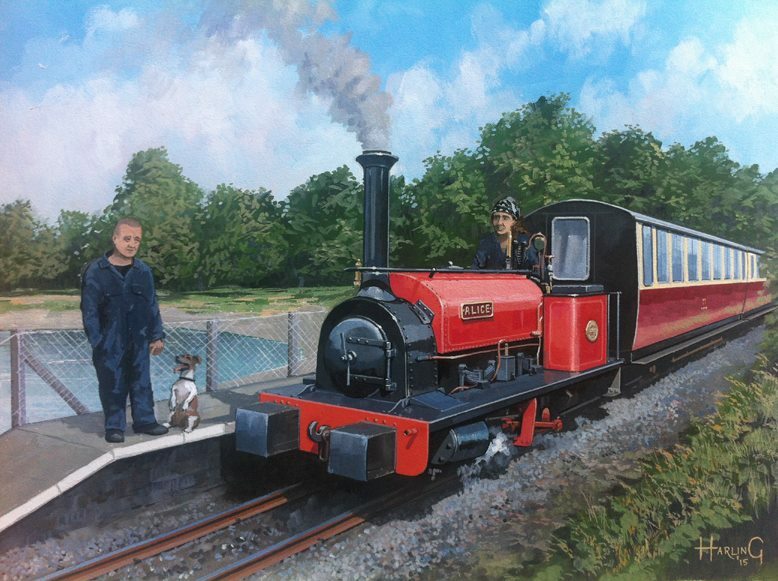 "Pip" the Jack Russell who featured in the painting of Helsby Station “Between Showers” sadly passed away after a short illness on Monday 28th September aged 13 years old. "Pip" was not only known at Helsby Station for her railway background. She travelled far and wide on the railways with her owner Ian Whitley who worked as a Manager on the Welsh Highland Heritage Railway for many years and she loved railways as much as he did. But Pip had her favourite line, the Bala Lake Railway where her owner has fired Steam Locos for many years now and this is where she has been laid to rest close to Llangower railway station on the shores of the lake. Nick Harling, the artist behind the "Between Showers" painting recently commissioned a new painting of "Pip". It shows her at her favourite place at Llangower Station, on the Bala Lake Railway, with her owner Ian Whitley. A limited copy print, limited to just 30 editions, is available to purchase. Enquires can be made at our website to Ian Whitley at North Cheshire Rail Users Group. All money raised will go towards the Bala Lake Railway extension. Many tributes have poured in for "Pip" from the many railways she visited and her passing was also mentioned on "Signal 2 Radio" where she also had many friends. There are also plans to put up a memorial at Helsby Station, in her memory. A fitting legacy to a truly remarkable railway dog.